AFPEx build 2.6 has been deployed. This update addresses the security features introduced by Java Version 7 Update 51. There are also some improvements with Apple Mac OSx operating system. The Java Security Certificates have been updated. If you experience any problems downloading the new security certificates, please clear your Java cache. A guide for clearing Java cache is available in FAQ - Java Issues page. FPL 2012 - AFPEx has changed! To comply with the ICAO mandated change for FPL2012, AFPEx will be updated. The new flight plan changes arrive on November 12th and will effect fields 10a/10b and 18 of the standard CA48 FPL form. As part of this update, we have also taken the opportunity to update the software with a new 'look and feel' as well as revamping the website with additional instructions and guides. The underlying functionality remains the same with some tweaks to make complex functions that little bit easier. Check out the 'Operate As' function in the Guides - Flight Planning Assistance section. AFPEx will not be sending in the new FPL2012 format until the agreed CAA date of 12th November. All users stored templates will move across to the updated system. From November 12th onwards, all users templates will need to be loaded and stored again to reflect the new FPL2012 format. To view the NATS official press release please click here. The Assisted Flight Plan Exchange (AFPEx) is an internet based flight planning system. AFPEx is designed for the filing of Flight Plans and related messaging, via the Aeronautical Fixed Telecommunication Network (AFTN), directly from your desktop or laptop computer. Approved users who are registered and operating within the UK, will be given a unique Login, password, and an AFTN address. 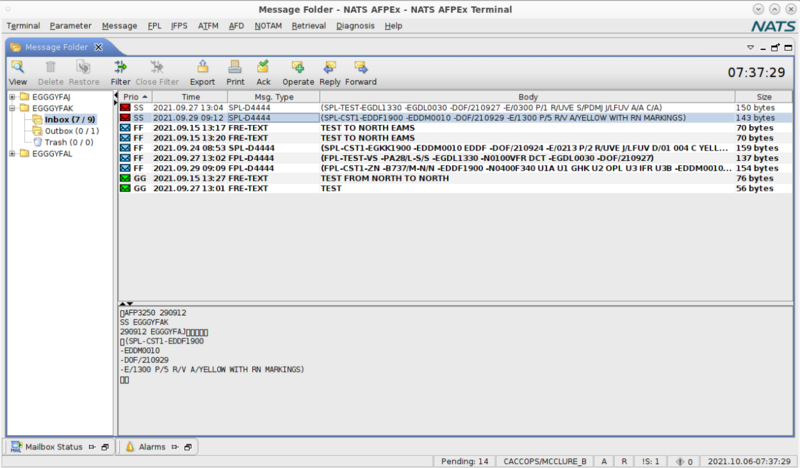 Once an AFTN address has been assigned, Air movement and Admin messages can be sent to any other AFTN connected stations worldwide from the AFPEx interface. The system is built around a highly stable multi-server platform and has a Fax backup facility. Support is available 24 hours a day 365 days a year.